We’ll start with his trait. 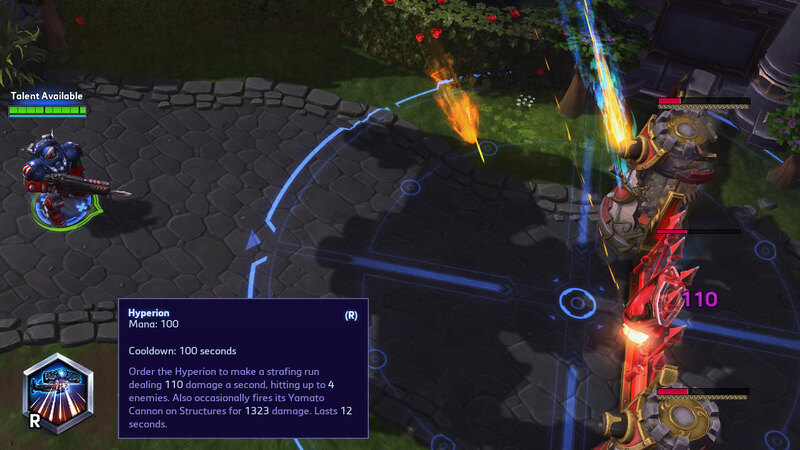 Raynor’s Basic Attack range is further than most other ranged Heroes, and his vision radius is further as well. 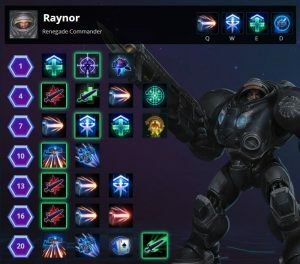 It might not look like much, but Raynor’s +1 range is actually really helpful. 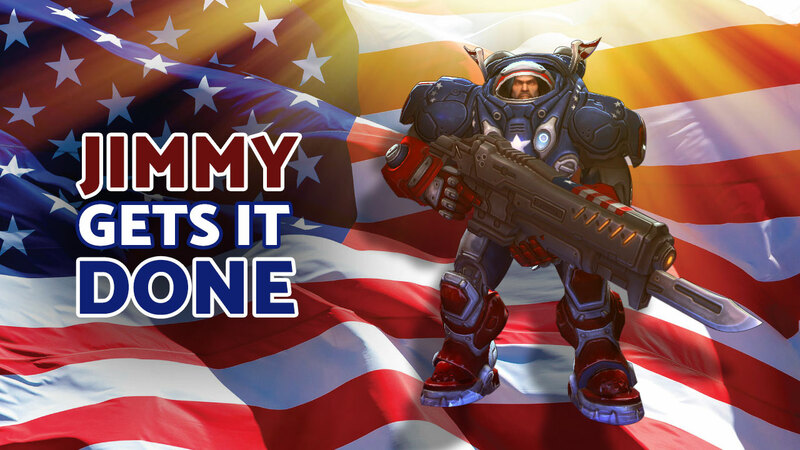 A simple and passive trait, Advanced Optics gives Jimmy a natural range advantage over most other heroes in the game. Being able to see and shoot farther means that Jimmy can sit back, relax, and grab a beer as he right-clicks his opponents to death from a distance. As your opponents advance, try to maintain maximum spacing from them to keep Jimmy in a safe place so he can continue shooting. This is a good time to mention “Stutter Stepping” — a tactic that a lot of people over-complicate, but isn’t actually all that hard to do. Essentially, it just means shooting while you move, which boils down to right-clicking the ground to move, then right-clicking an enemy to shoot them, then right-clicking the ground to move again. Stutter Stepping can take time to master, but if you start out by simply making sure that you shoot, run, shoot, repeat, you’ll have it down in no time. If you want a more detailed explanation on Stutter Stepping and right-clicking versus attack-moving, check out Bakery’s video. Let’s talk about Jimmy’s abilities now. There are only two Basic Abilities that you actually need to worry about using, since one of them activates automatically. Penetrating Round knocks enemies away, giving Jimmy room to breathe. Penetrating Round is Jimmy’s “get off me!” attack. If someone is getting in too close, use Penetrating Round to push them back and give yourself some space. It’s also useful as a disruption ability against the enemy team. Be careful to avoid using this ability in a way that hinders your teammates. Raynor players often make the mistake of using Penetrating Round to knock back enemy minions and mercenary camps, which splits them up and makes it harder for teammates to damage them. Since it pierces through multiple enemies, you can sometimes hit a few enemy heroes all at once with the shot. Just make sure that the knockback doesn’t actually end up helping the enemies to get farther away from your team. If you have any doubts, just keep right-clicking them to death, that’s what Jimmy does best. If you have teammates in a flanking position, you can use Penetrating Round to knock the enemy towards your team, setting them up for a combo. Inspire increases Jimmy’s attack speed as well as his teammates’ and allied minions’. Jimmy is a natural leader. When he attacks fast, all of his nearby friends do too. Inspire works on friendly heroes and minions alike, which gives Jimmy a decent ability to push lanes and makes him pair well with other auto-attack heroes. When to use Inspire varies on the situation; often, you want to save it for when an enemy is low to finish them off. Other times, you might want to use it just as your teammate lands a stun or root, to get that extra burst of damage during the lockdown. 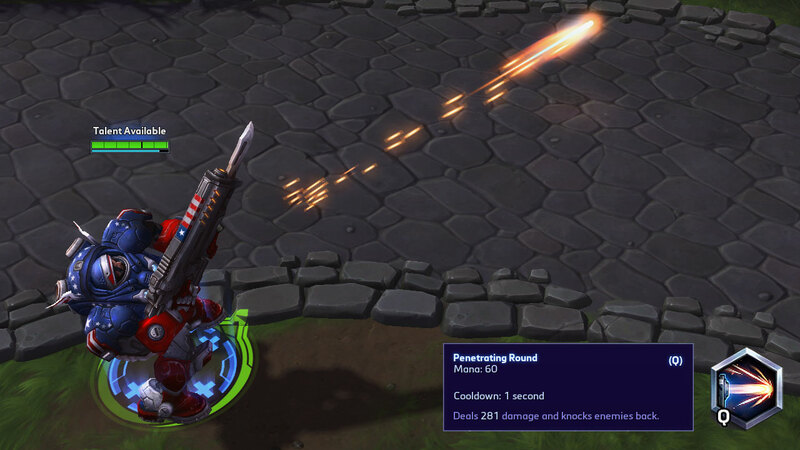 At Level 7, “Revolution Overdrive” makes Inspire grant movement speed per-inspired hero. The extra run speed helps Jimmy and his teammates with both engaging and disengaging. Automatically activates to heal when Raynor is below 30% Health. Adrenaline Rush heals Jimmy automatically when he drops below 30% Health. Adrenaline Rush is that little pick-me-up that you need when your life is down. It kicks in automatically when you fall below 30% health and heals for a substantial amount. The relatively short cooldown of 30 seconds means it’s almost always there when you need it, provided you keep your distance and use Penetrating Round to keep enemies at bay. Order the Hyperion to make a strafing run dealing damage, hitting up to 4 enemies. Also occasionally fires its Yamato Cannon on Structures for extra damage. Lasts 12 seconds. WOAH, this thing is huge! I recommend this as the primary pick because it lets Jimmy summon a giant friggin’ spaceship. The Hyperion flies in a straight line, constantly shooting enemies and structures below it. It’s great for team fights, pushing, or as a zoning tool to force the enemy out of an area. The main downside to this heroic is that it has a fairly long cooldown time of 100 seconds, which means you need to use it wisely — you won’t have it again for a while if you waste it. Summon two Stealthed Banshees that attack an enemy. Each Banshee deals damage and lasts 22 seconds. Can reactivate the Ability to re-target the Banshees. Unfortunately, the Banshees tend to get killed easily during the course of a fight, which limits this heroic ability’s usefulness significantly. Still, it has a solid niche as a harassment ability, particularly for catching slippery enemies or pressuring an enemy out of an area. There’s almost no reason to pick anything but Seasoned Marksman in this tier. The raw damage that adds up over the course of a match is fantastic, and completing the quest grants you even more damage via an activatable ability that increases your attack speed by 40% for 3 seconds. Against dive-heavy comps where you absolutely need extra survivability, Give Me More can be an option, but Jimmy will lose a huge amount of damage for doing this and it’s not usually worthwhile. Another tier without much choice, Focused Attack is just too good to pass up. Every 10 seconds, Jimmy’s basic attack hits 60% harder, and the cooldown of this effect is reduced by 1 second every time you basic attack. Just sit back, get comfy, and right-click your enemies into oblivion. Like the previous tier, in very niche situations Vigorous Assault can be worth it for the added healing, but at a another big loss when it comes to damage. Revolution Overdrive’s added movement speed on Inspire is extremely useful and will save you and your teammates more often than you might expect. Fight or Flight gives a nice defensive boost, making Adrenaline Rush provide armor and allowing it to be manually activated. It’s usually not as good compared to the added mobility of Revolution Overdrive, though. As mentioned above, you will usually want to take Hyperion here. Giant Killer is another obvious choice and works well in almost every single scenario. 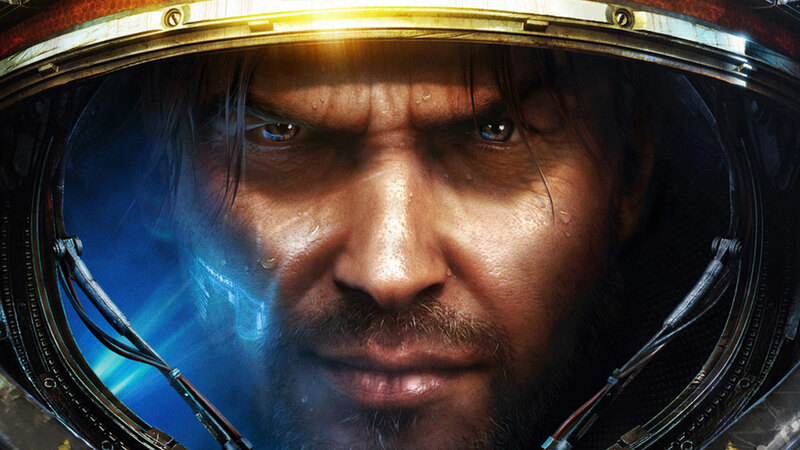 Dealing raw, percentage-health damage makes Raynor great at poking down enemy tanks, which he can do from a safe range thanks to Advanced Optics. Executioner is ridiculous, providing 30% more auto-attack damage against enemies that are slowed, rooted, or stunned. The damage from this ability, combined with Giant Killer, Focused Attack, and Seasoned Marksman in the tiers before, turns Jimmy into a raging torrent of destruction who rains right-click-death upon any enemy foolish enough step within his range. Just make sure that you know which of your teammates have slows, roots, and stuns so you can prioritize their targets. Oh, uh, or… if you want a stun on Penetrating Shot, you could take Bullseye instead. Did you read the last paragraph about Jimmy becoming the a torrent of destruction? He wasn’t done yet! At Level 20, Nexus Frenzy grants him 20% more attack speed and even more range. Sweet baby Thrall, have mercy. 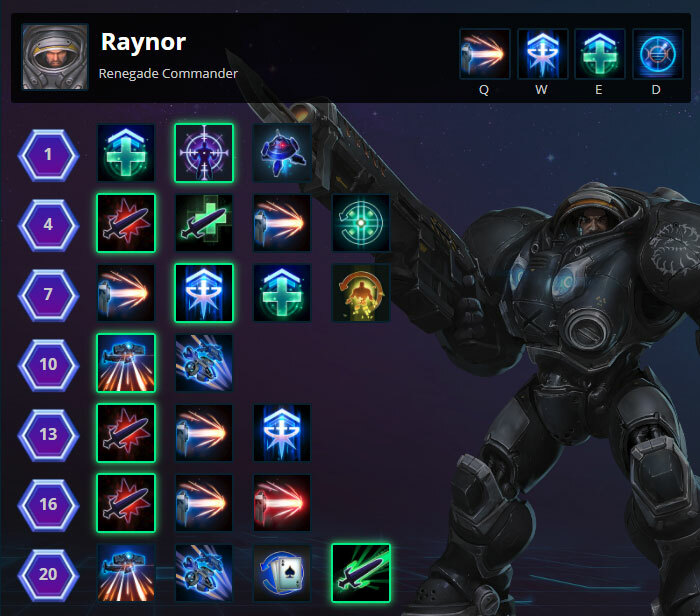 Whenever there is a Level 20 Raynor in the game, everyone on the opposing team is sure to be crying for mercy. Jimmy fits fairly well into most groups, but he shines when paired with characters who have persistent slowing abilities. His Executioner talent at level 16 works with slows, roots, and stuns alike, but generally it’s hard to keep roots and stuns going for long. Slows, on the other hand, are more widely available and able to be kept up for longer and applied more frequently. 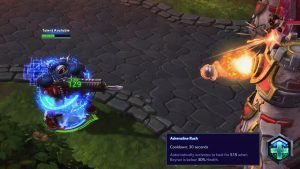 Johanna, Varian, Arthas, Tyrael, and Leoric all have base abilities that slow the enemy, so they are naturally great fits. Jaina pretty much slows everything she touches, so she and Jimmy are good buds. 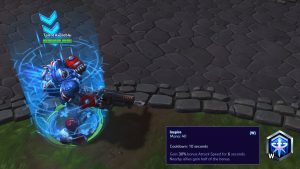 Even if your team doesn’t have many innate slows, most heroes have a talent that they can pick to add a slow to their kit before level 16 when Raynor gets Executioner. 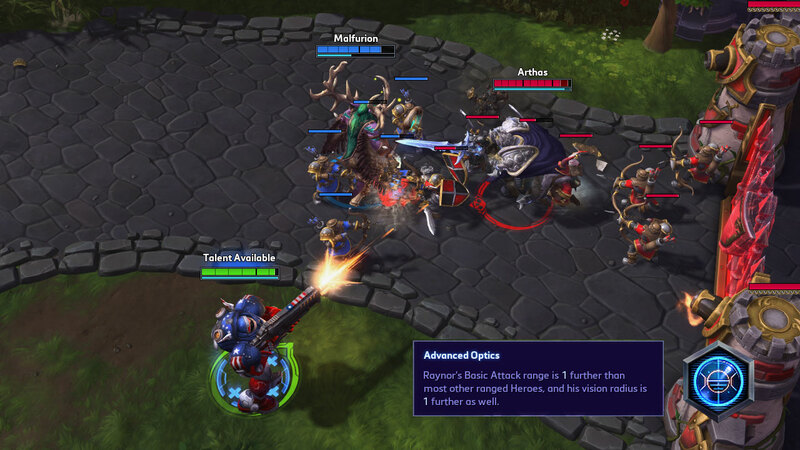 Raynor’s main weakness is against heroes who have a blinding ability, since almost all of his damage comes from his basic attack. 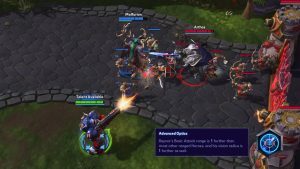 Cassia, Li Li, Johanna, and Artanis can give him a bit of trouble with their blinds, but playing smart and having good positioning will help you avoid those issues. He can also have a bit of trouble getting dived-in on from heroes like Genji and Illidan. Usually, Adrenaline Rush and Penetrating Round will help you stay alive, but you will need to position well and keep your distance when it’s on cooldown. If you’re fighting against dive-focused enemies, be sure to keep poking them so that when they finally do get a chance to dive, you’ve already put some damage on them. Raynor isn’t all that great at clearing minion waves, which means he can have a hard time clearing map objectives that focus on killing minions, such as Infernal Shrines, or defending against things like the Zerg on Braxis Holdout. This doesn’t make Jimmy a bad pick, you just need to be sure to add at least one hero with solid wave clear to your team. On the flip side, his long range and persistent auto-attack damage make him a great candidate for defending against Bosses, the Garden Terror, Dragon Knight, etc. He can safely peck them down from a distance without much worry. Jimmy is a simple man who enjoys the simple pleasure of shooting people in the face. Don’t let his lack of flare mislead you, he is an absolute beast on the battlefield.